Organic. Great taste gold 2015. Packed in cold-pressed oils. A great British company. Real food produced in Bristol since 1998. Suitable for vegetarians. 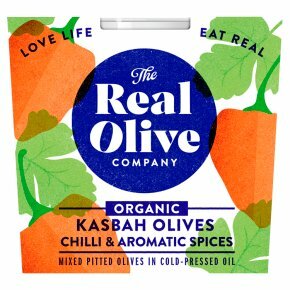 Our organic olives are grown and cared for the way nature intended, retaining all their goodness and natural vitality from tree to table. Warning: Whilst every care has been taken to remove olive stones, some stones or fragments may remain.